"We like Allseeds case as the company is current leader at the market with a team which has vision. Together, relying on this team we will take an opportunity to bring Allseeds to the new level", - said Daniil Pas'ko, Managing Partner Diligent Capital Partners in his interview to AgroPortal.ua. Daniil, What is your assessment of the beginning of land reform? Daniil Pas'ko: The landmark in this issue was the decision of the European Court of Human Rights taken this summer. It looks to me as though this is the turning point, as in fact land sale moratorium is not only agrarian industry issue. This is primarily property right issue for 7 million persons, because in fact for the time being they have been deprived of it for 19 years. Moreover, politicians promoted land sale moratorium under the slogan of reputed co-owners protection. It is an interesting collision as public authorities have protected land shareholders with moratorium, deprived them of their title. European Court of Human Rights put an end in this issue: it awarded damages to two plaintiffs, confirmed infringement of their rights, took the decision against the Ukraine. Some hundreds of Ukrainian land shareholders filed lawsuits. Two of them were brought to the final result. The decision taken by ECtHR covers the history of the issue, all pro and contra, pleadings of systematic violation of civil rights, non-performance of obligations by our state. This is largely responsible for the fact that 7 mln. of Ukrainians could not make use of their major asset – land. What the other land shareholders should expect as the result of such court decision? Daniil Pas'ko: In fact, the court has been already acknowledged infringement of the rights of other land shareholders in Ukraine. It is worth noting that ECtHR decision gives the Ukraine reasonable time to rectify violation connected with moratorium existence. In case failure of Ukraine to rectify such violation, next plaintiffs will be awarded compensation. That means that in such a case it will not be two separate suits, potentially it will be 7 mln. of lawsuits and 7 mln. compensations. It is not big money in the practice of the European Court of Human Rights, however if multiply several thousand Euro by seven million, Ukraine is meant to compensate billions. However, the Constitutional Court of Ukraine for the second time refused to recognize the moratorium as unconstitutional, having mentioned that this is a political decision. Daniil Pas'ko: Yes, it's true, the Constitutional Court for the second time refused to lift moratorium. Let me say here that Constitutional Court decision contains special opinion. One of the judges – V. V. Lemaka - already established in written the position disagreeing with the decision of the court. In this special opinion, he basically stated his own opinion, which coincides with mine. Land moratorium violates human rights, as recognized by the European Court of Human Rights. Why does the Constitutional Court call this question political? I find it rather difficult to understand this position. To my point of view it is likely, that Constitutional Court is driven rather by political motives, than legal ones. Do you believe that land sale moratorium can be lifted without relevant voting in the Parliament? Daniil Pas'ko: I think that theoretically this could happen. I hope you've seen that a case appeared in the court register in which a Ukrainian for the first time ever defended his right to exchange land, referring to the decision of the European Court of Human Rights. In general it is really important result. I do not really believe that a law will be born somewhere in the guts of the Cabinet of Ministers or Parliament, which will open transparent market based on relatively liberal market principles. I rather hope that court judgments will become catalyst for market launching. If not, then the judgments of Ukrainian courts on the basis of the decision of the ECtHR will sooner or later force the parliamentarians to solve this issue. In what way and in what form? It depends on complicated systems of influence. Now it's major question: if to launch the market, then in what form it needs to be started, what about legal entities', foreign investors' access to it? Daniil Pas'ko: This is a question of major importance, as if the market will be launched lot of restrictions; it will not be a real reform. First of all, land owners will suffer. A simple law of supply and demand acts here. This is the first chapter in any book on economics. The higher the demand, the higher the price is, the lower the demand, the lower the price . Any restrictions on the demand or removal legal entities or foreign entities from demand have directly proportional effect to the price reduction. Any restrictions at market launching cost a pretty penny to the land owners. I personally believe that all restrictions are harmful both for land shareholders and for the economy of Ukraine. That means you support completely liberal model of land market launching? Daniil Pas'ko: Yes. This is the way market acts in all successful countries. EasyBusines has codyfied all cases of 66 countries relevant for Ukraine. We have studied each country for land market functioning, retrospective of land market development. The analysis has shown that risks that Ukrainian politicians are currently speaking of, have not materialized in any of these countries. For example, major risk they are talking about is land buying up by foreigners. There is not any country among those allowed foreigners to play at the land market, which has significant share of their ownership. In Romania, as soon as the land market has been opened for foreigners, land price almost immediately began to go up quite fast and added 20%. Who is interested in it? Landowners, for sure. In fact, it is useful for the economy as a whole. Land can be used as security asset, and this is a strong signal to investors. Second risk politicians are talking about is the risk of land concentration and monopolization. Daniil Pas'ko: Again, we have not find aby example of monopolization in the countries with no restrictions on the managed area. In addition, the more liquid the market is, the higher the price, and it is much more difficult to accumulate large areas, as one needs to pay more for them. And by the way, our anomaly with agrarian holdings, which have hundreds of thousands of hectares, is exactly connected with the fact that land in Ukraine is worth nothing. As soon as this land will cost market money, this will be the major response to monopolization risk. Land owners will act intensively, not extensively, will enhance efficiency, invest in technology, irrigation and do their best to get highest yield and maximum profitability from the minimum area. Second: there are absolutely civilized ways to respond to monopolization risks - Antimonopoly Committee work. Our country has antitrust law that can respond to such a challenge. That's the way it is done in all civilized countries. Why suddenly we need to impose restrictions on the amount of land in one hand for the whole land market? It is absolutely pointless. The same applies to restrictions for legal entities. What's the point? This means that the main parties which work farmland will not be allowed to own it. It will only breed a network of indistinct individuals, who will be registered owners of the land, and in fact someone else will be behind them. This is the way to bring the market to the shadow and, accordingly, to loose tax revenues. Neither of civilized investor will come into non-transparent market. Did you hear of the necessity to establish minimum price for the land in Ukraine? Daniil Pas'ko: Yes, I heard that the Government is considering the issue. Hope they understand that these restrictions will cause price reduction. There is not any example throughout the world with efficient price regulation, when the state fixes the price to any goods. We've participated in such experiment already. It lasted for seventy years and its name was the Soviet Union. What's the end point? One price is written on the paper and actual deal is done for the other price. In fact nobody is protected with this approach. It is again the way to bring the market to the shadow. That is, right now land sale moratorium is one of the main obstacles to investments in Ukraine? Daniil Pas'ko: Yes. In addition investments are for years already scared with uncertainty in this issue. Any long-term investments are impossible in uncertain environment. How one can make them if in the terms of investment game rules can be significantly modified? Currently, we are already for 19 years in condition when something interesting is happing with moratorium to the New Year. This is the major point discouraging any long-term civilized social investors. There are certain risks connected with military conflict. It impeded us from raising funds and, in fact, postponed our fund launching for several years. This risk is absolutely impossible to be calculated and predicted for a foreign investor. There are foreign investors who have learned to work with such risks as currency fluctuations, corruption, and political dictatorship. They are present both in Asia and in Africa, and some practice has already been formed concerning the ways to works with these risks. But the risk of a military conflict with nuclear state is something that does not fit i any standardized established models and it is purely Ukrainian phenomenon. Therefore, it significantly constrained investments. However at the same time you've found reasoning to facilitate the deal in 16% Allseeds equity stake purchase by Dutch bank and Diligent Capital Partners? Daniil Pas'ko: We've started fund rising in 2015. It was obvious that it is difficult to speak about real investments until stabilization of the situation in Ukraine. Unfortunately, Ukraine did not show successful cases of fund raising for international foreign investors. Along with this everyone heard about Ukrainian potential and everyone knows of it. Regular investor question is as follows: “Why for the last 20 years it is not any list of entities who came, earned money in Ukraine and took back their capital with a profit. If no one has managed to do it before, how to convince investor that this will work out this time? In addition, Ukraine is featured with a standard set of obstacles — lack of supremacy of law, lack of property rights protection, corruption. This set is not the unique feature of Ukraine. It is present in many markets. It interferes, but it does not totally stop capital flow. Sure, it would be great if Ukraine showed significant progress in any component of this set, but it has not happened yet. In May, I've been to Washington to the biggest global conference on investments into developing markets. Intrinsically this conference is the site for professional investors' meeting, the place where deals are closed. Romania was starring because for the last few years former Prime Minister, half of Ministers and even President have been convicted and are in the prison now. The country shows not fictitious corruption therapy and the fact that the state is subject to modifications. It is discussed by everybody and is perceived as a signal that situation will change. Investors are sensitive to certain signals, directions, vectors. It's a pity to say so, but we do not generate such signals or under generate them. You are working with agrarian sector for a number of years. For the last ten years the number of professional investment funds being focused on food and agro increases. Can you tell to what extent and why, what is the total capital managed by them and what classes of assets these funds go to? 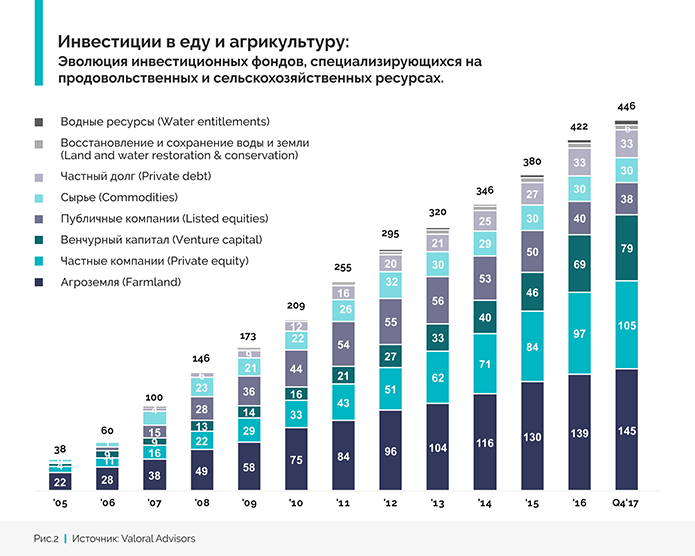 Daniil Pas'ko: According to Valoral Advisors investment consulting boutique data, in the period from 2004 to 2017 the number of professional investment funds focusing on food and agricultural industry increased 12 times, from 38 to 446. The capital managed by these investors exceeds $ 73 billion. We see both - the explosive growth in the number of these funds and in the capital under their control. AgriFood-industry attracts investors. At the same time, 40% of the workforce is involved globally in food production. This shows a certain imbalance, which, in my opinion, will be coped with time, and the number of these funds will grow. 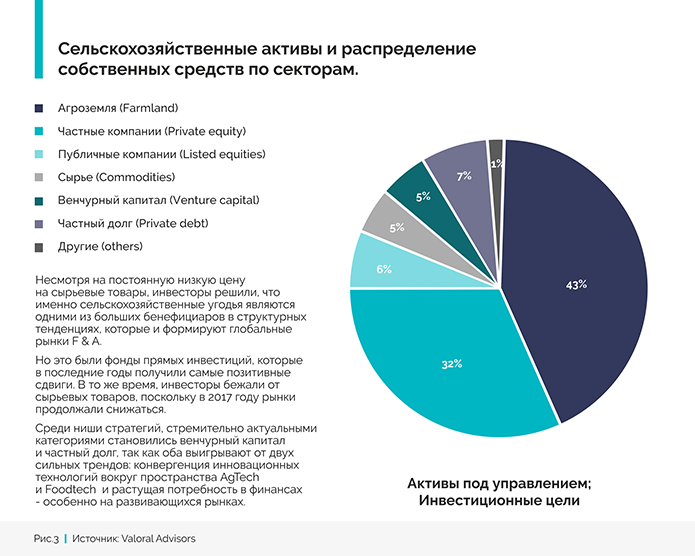 If to talk about these funds structure, there are obvious leaders: agro-land (43% of funds is focused on land) and growing private companies that have not yet been publicly traded (32% of funds with the “Private Equity” strategy). First type is the funds investing in land, they purchase land and further on let it for lease,they do not work it by their own. These are mostly American funds which are public companies. They are working in various countries, however mostly in the USA and Latin America. Is NCH such a fund? Daniil Pas'ko: NCH is not such a fund as it is not land owner. It is investor-leaseholder which invests into management. In mature market it would be two different structures: one fund would own land and let it for lease, and NCH would work it. It's a bit different in Ukraine. Is it possible that such "land focused" international funds will come to Ukraine? Daniil Pas'ko: Capital managed by such funds makes trillions of US dollars. I am sure that Ukraine could definitely could get some of this capital. What would happen? See below challenging dynamics of land prices in the US for 2005-2017. I will show you striking graph of the farmland price behavior in the various states of US. The lowest price per hectare was $ 2,000 in 2005, and the highest price was $ 11,000 per hectare. During this period, in free market environment, minimum price increased to $ 4,000, and maximum - to $ 16,000. 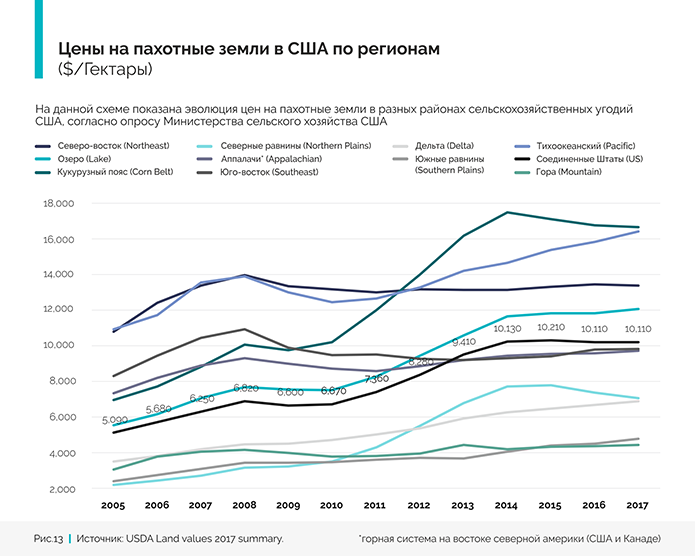 This diagram shows plough land price evolution in the various regions of agriculturally used lands in US as shown by the poll done by US Ministry of Agriculture. In fact, the price is determined by the cost of capital and and work efficiency. If Ukraine had an open market, we can expect for similar costs. Ukraine has 38 million hectares of farming land. If multiplied by $ 16,000, the economy will receive $ 600 billion. Let's take $ 6,000 per hectare, then we get $ 228 billion. Ukrainian GDP is estimated as $ 100 billion. We go around the world with hat in hand, begging for a billion dollars, while not using an asset of 200 billion cost. We just frozen it, turned it off. It does not function at all. We use the earth to generate some kind of totally inefficient value added product. Free land market means taxes that can be obtained as a result of transactions, the pledging capability of assets to draw down new loans, it means investments in infrastructure. How is Ukrainian attractiveness for AgriFood-investment funds is rated? Daniil Pas'ko: It is one of the last countries in a list. Nevertheless FMO bank from Netherlands came in Ukraine. Daniil Pas'ko: FMO is Development financial institution, that is financial institution created to develop regions. EBRD and IFC have similar mandate. As as structure, FMO was created not only to make money. Moreover, making money in such structure is only a tool for effectiveness evaluation. They are created in order to facilitate positively changes in certain regions. Their mandate also includes Ukraine. We see these organizations as the key investors in Ukraine. Ukraine attracts only those organizations that are created in order to develop challenged regions. What is the advantages of Diligent Capital Partners in finding investors? Daniil Pas'ko: We are playing in this market for all our lives, we are able to work with the risks that stop other investors. Their challenge is our opportunity. We like the fundamental issues that make Ukrainian agro-industrial complex competitive. First of all, it is the low cost price of basic crops, which provides further competitive advantage along the entire chain. As a minimum, this creates the margin between buying and selling, if just to export raw materials. The second component which makes effect on cost price is logistics. If in Brazil, Russia, Canada, the United States of America distance to the deep-water port makes thousands of kilometers, in Ukraine this is an average of 500 kilometers. If there were no such logistical hindrances as unavailability of Ukrzaliznytsya freight cars or bad roads, then this would be even more attractive. What is your company strategy at the moment? Daniil Pas'ko: We want to build global investment fund focused on agriculture, we want to scale to other regions the experience and expertise that we will obtain in Ukraine. In my opinion, Ukraine is a good launching pad, and there is sufficient number of companies here as potential for cooperation, and to go to the other regions as they grow or outside their growth. It can be Eastern European, North African, Middle East countries. We are proactively viewing the deals at the moment. What is your major interest? Perhaps processing or bioenergy, the majority goes there. Daniil Pas'ko: We do not consider bioenergy as for the time being we have not yet seen a case that would attract us. We are definitely looking at crops growing, as there are big companies doing it efficiently and we be of assistance with our capital. Challenge of farming now is that risk of rules of the game changing with land moratorium exists, along with the risk of the way to lift it. We also see price volatility in global markets. Farming margins intensely vary year by year due to two factors ut of control: weather and global prices. The more we approach the finished product that a person puts in his/her mouth, the more stable the price and margin are. Therefore, we are looking at the entire production chain: from seeds, plant protection products, fertilizers, machinery, technology, logistics, storage to processing. Today we see attractive cases in processing, such as Allseeds. Anyway, I would like to invest not only in development of Ukraine as a source of raw materials, but also to invest in converting raw materials into some heavier product with a higher added value. 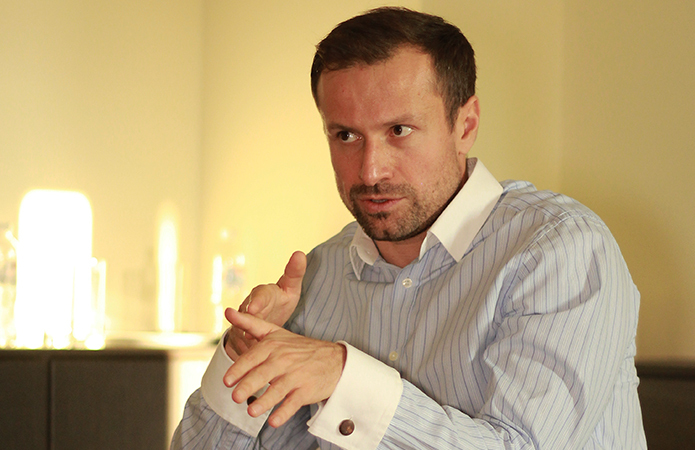 Daniil Pas'ko: Sure, we are looking at mature businesses. Minimum amount of investment for us is 5 mln. USD, comfort amounts make from 10 to 20 mln. At the same time, we are a minority investor, we like the Allseeds case, because the company is the leader of the market and has a team with vision. Together, relying on this team, we will be able to take Allseeds to a new level. Sometimes big companies are aware how to attract investors. Why would you recommend them to start with? Daniil Pas'ko: You and your readers need to understand one thing: capital in the world is practically endless. Much more capital is available than high quality teams with good business models. Capital is the raw material that runs after unique teams. If there is a good team, business model and good vision for the next five years, then the capital will come running by itself. However there are certain terms. Business must be transparent. It should pay taxes, it should be free from stories of fraud against creditors, second set of books, conflicts of interests, claims of former shareholders, cash. How one can invest in the company financial statements of which are impossible to be audited? What investments the company can count on if it itself does not know if it is profitable or loss making? How funds can be invested in a company that does not pay taxes. The company that tomorrow can be visited by tax inspectorate officers and it will get imprisoned half of its management? How anyone can invest in a company that has stolen money from a bank? How funds can be invested in the company subject to accounts blocking or which has some old 'tails'? Or how funds can be invested in a company owners of which are political figures, with obvious conflict of interest, and their business develops just because they are fed from some kind of corruption schemes? In such a case Ukraine can provide no more than 10 companies for investors. Daniil Pas'ko: There are a little bit more of them. We see successful agricultural companies proactive in funds raising at international markets and those performed IPO, placed bonds, attracted EBRD money. The majority of the public Ukrainian companies are from the agro-industrial complex. What is the role of owner's reputation while funds raising? Daniil Pas'ko: Sure, it is important. In fact, first and foremost for us is human factor. Neither business model can compensate for different values. If the values ​​of a businessman is out of synch with ours, even if he/ she has fantastic business model, we cannot invest as sooner or later this will cause conflict. Difference in values ​​always brings to conflict. And conflict always causes loss of money, even if it is high quality business. For us, investment issue is not the issue of the margin cost or sea access availability; first of all it is personality of the partner. Tis year is the pre-election year. How does it make impact on investment activity? It seems to me that now almost everyone is slowing down, being waiting for what will happen after the elections. Daniil Pas'ko: To my opinion, this is more likely to be noise than reality. I see that electoral cycles do not slow down actual investors, who understand what they are doing. Generally, elections take place every five years. Long-term professional investors are more likely to look at fundamental issues related to the industry as a whole, to the company, to the partners rather than to any electoral matters. Is closing the deal with Mriya a positive signal? Daniil Pas'ko: Yes, it's really positive signal. Mriya is a horrible case of money theft. I can hardly recall the case which has made as much harm to investment appeal of Ukraine as this scandal. One of the key issues of our market is creditors' rights protection. It means that sometimes it is impossible to collect debts, that zombies remain at the market, taking advantage of judicial system inefficiency and continue to work while they are in default. The court machine should work without mercy, there should be no pity here. If you did not return the money, you must lose your business. Full stop. You must be removed from the market. This is a fair market punishment. Only in such a case market will be cleaned from ineffective teams of businessmen. This will significantly reduce interest rates as well. Why do you think we have interest rates of 9-11% in USD? Because of the risks of lenders that banks take. As soon as the risks will be mitigated, as soon as effective system for collecting debts or assets taking away will be introduced, then, accordingly, interest rates will fall. And low interest rates mean the development of the whole market. What about Chinese investors, do they have interest to Ukraine? Daniil Pas'ko: No. That's because the Ukrainian government stole money from them in 2013. We are talking about a loan for GPZKU. China's investments are always linked to strategic interests, and this must be taken into account. China is investing not only for economic purposes. Its investments always have political implications. Maybe it is cheaper for us to pay the debt to Chinese than to wait for their funds raising and surrender our interests. I am on investment attraction from China, however we should not miss the other opportunities. What are the key reforms necessary for the Ukrainian agricultural sector above all? Daniil Pas'ko: In addition to the land reform, it is necessary to solve the issues related to efficient supply chain creation for raw materials exporting. We should not have any troubles with goods delivery to the port. We have a problem with the Ukrzaliznytsya monopoly, while the majority of the post-Soviet countries have successful solved it long ago. In the majority of post-Soviet countries, the entire car fleet has been privatized. Only private companies can make investments in the railway. There is also a need to simplify investors' access to the land in Ukrainian ports. This can be done either through privatization and land sale model or through land placement in concession. Rental relationships in this area are ineffective. The investor will not invest much in an asset that he/ she/ it does not own. We also need to solve basic stuff: possibility for new investment projects to connect to gas, water electricity supply lines fast and without corruption. At the same time, money value remains the main obstacle for investments in general, however country risks make big impact on it. To mitigate these risks, it is necessary to reduce external debt, increase GDP growth rates, and modify the approach to budget expenditures. In Ukraine, country risk is at 9% level, and commercial risks related to property rights protection superpose country risk. What is you anticipation of GDP? Daniil Pas'ko: Our personal GDP forecast is rather conservative. Current Ukrainian success of 3% GDP growth is our failure. In the third quarter of 2018 US GDP increased by 4%. We need to grow 2-3 times faster, because we are a developing country. Our growth is also associated with global growth. In case situation in the global market will change, all our growth can disappear. Under stable external conditions, I can predict Ukrainian GDP growth by 3.5-4%. At most. To facilitate our growth, we need true fight against corruption, law-enforcement and judicial system reform, land sale moratorium lifting, and transparent privatization. Such systemic efforts can change the rules of the game and lead to 6-8% growth of Ukraine’s GDP.